Allen Removals & Storage Ltd is Ireland’s leading home and business removal company. Trading successfully for over 40 years, the family-run business makes moving your home or premises easy. Established in 1975 by Eamonn Finn, Allen Removals are renowned as efficient, professional and careful movers. The Dublin-based company employs a highly-trained, skilled and experienced team to take care of all your removal needs. It also boasts a large modern fleet of custom-built vehicles, all with air-ride suspension and the very latest in safety packaging. In addition, the mover offers a 24-hour security controlled and temperature controlled warehouse where your goods are stored in their very own purpose-built containers. Every project is carefully and continuously monitored from start to finish to ensure complete customer satisfaction. “We’re good at what we do,”says Eamonn, whose son Edward has filled the role of transport manager for the last nine years. “We are a long-established, award-winning company offering a friendly, reliable and cost-effective service. We move goods all over Europe and ship worldwide. In the UK, we enjoy an excellent working relationship with other removals companies such as John Mason, Matthew James and Britannia. We work for a different client every day. Repeat work and word of mouth are very important to us. Having started with a small Ford rigid truck and two staff after working in the transport industry in the UK for a number of years, the Ballaghaderreen, Co. Roscommon native has grown his business to become the largest moving specialist in the Republic of Ireland. 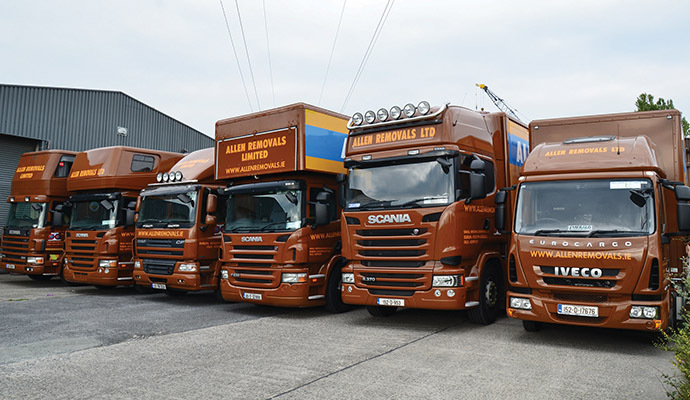 Currently, Allen Removals employs almost 50 staff, including 14 drivers, and operates a 16-strong fleet of rigids consisting of 10 Scania 18 ½tonne, five Iveco 7 ½tonne and one DAF 18 ½tonne. Two of the trucks are based in the UK full-time. Allen Removals are market leaders in domestic and commercial relocation solutions. 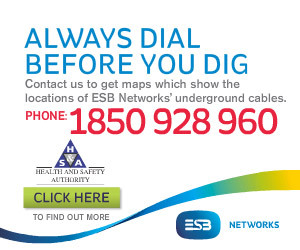 Whether relocating in Ireland or internationally, the company strives to assure a smooth transition. Other services offered include storage; confidential shredding; archive / document management; fine art; IT relocation; heavy machinery; furniture removal; hoist hire; crate hire and pet transportation. Allen Removals has established itself as the most reliable and professional removal firm with financial institutions right through to industrial manufacturers. Household removals account for about 50 per cent of the company’s overall business. At your request and without obligation, one of its surveyors will call and discuss your planned move. You will be offered help and advice with a detailed explanation of its service that best suits your needs. Allen Removals prides itself on making your move as seamless as possible. Commercial / industrial removals are another speciality. Allen Removals have a dedicated crew of corporate move specialists who will work with you to devise a plan that eliminates stress during the office relocation process. The company treats all contracts –large or small –with the same level of care and attention. The small client with the smaller office is as important as a major corporation. “We provide a 24-hour, 48-hour and weekend moving service when it comes to office relocation,”Eamonn explains. “You leave your old office on Friday evening and walk into your new office on Monday morning. On arrival day, we will meet you at your new premises. With your direction, your goods will be placed exactly where you want them. All items are carefully wrapped and put safely into their correct location. We won’t leave until we have done all we can to make moving into your new office an easy, safe and carefree event. As well as being experts in storage –providing temporary storage, commercial and document storage –Allen Removals have a disposal service available for redundant office furniture and equipment, with everything being disposed of in an environmentally-friendly method. Allen Removals operates from a custom-built 42,000 sq. ft. heated warehouse on Walkinstown’s Greenhills Road. The office is staffed with 12 trained professionals to deal with all enquiries from removals and storage to accounts and advice. All enquiries are recorded and sorted through a computerised system called Move Administer, which is specifically designed for removal companies, so as to ensure that all calls to the team are managed efficiently. The company has seen a growing demand for its international removal services, with the recent acquisition of a UK company that mainly dealt with UK to Ireland consignments helping to secure an array of new customers needing backloads from the UK. “With our massive increase in work to the UK, this has become a valuable source of revenue. It has allowed us to greatly reduce our lead times on shipments in both directions,”Eamonn adds. Last March, Allen Removals became one of the first companies in Ireland to achieve ISO 9001:2015 for its quality management system. The company previously achieved ISO 9001:2008 in May 2011, having been assessed against its provision of domestic, commercial, industrial and international removals and document management services to the public and private sector. In 2013, Allen Removals received the Green Mover Award at the Irish Logistics & Transport Awards. This was a fantastic achievement given that the other finalists were Bus Eireann, Dublin Airport Authority, Fleetmatics, Greenaer and Samskip Multimodal. Allen Removals was also nominated for the Overall Logistics & Transport Excellence Award in 2013. Allen Removals has coming through the recession with flying colours and is growing both domestically and internationally. “It was a difficult time for everyone in business and the toughest times we can remember, but you don’t stay in business for 40 years without learning a few things about survival. There is an increasing demand for our removal services at home and abroad. We’re looking to the future with renewed optimism,”the affable managing director concludes on an upbeat note.